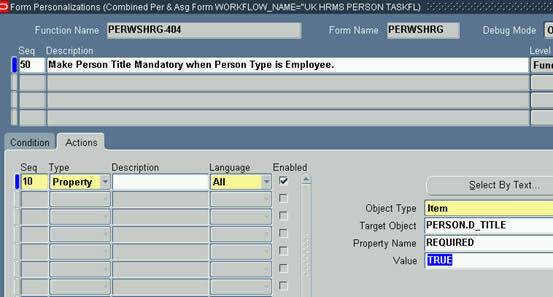 For quite some time I was thinking about publishing an article about forms personalization in Oracle HRMS. Forms Personalizations. I am a visual animal, so I like to explain in that manner too. My first article in the series of Forms Personalization is in response to a question raised in Oracle Forum under Oracle Human Resources (HRMS ). As per the Oracle forum request, If the Person Type is Employee, their clients wants Person Title field to become Mandatory ( lets assume it is the title field for now). When the Person Type field changes to a value that is anything but Employee, the person title field should then toggle back to become optional. Now the requirement is that for “Employee” field PERSON.D_TITLE must be made mandatory. There are two possible ways the Person Type can change. I have tested the steps below myself, and they appear to work. Description: Make Person Title Mandatory when Person Type is Employee. Anil, iam getting a ora 00911 error for the conditions.Any checks on the syntax? Invalid Character can be caused due to various reasons. Please email me the screenshot. You can also trace the Forms session, and see the last executed SQL when eorror occured. However, this error may not always occur from SQL, this can also be raised if you assign character value to a Numeric form field. Superb. Anil Thanks a lot for your documentation. You are a genious. You can have this segment in context sensitive for this responsibility by following guidelines in this link below. What version of Oracle Apps support the Form Personalization? So, 11.5.10 it is ! CUSTOM.pll and FP can both be disabled for a session by turning Custom Code off, from Help Menu. I do not think that applies to you though. Please close the form and re-open after clicking on APPLY. Didnt know where exactly to post my question, hence posting it in this section as it seems to be more relevant. Message : A user defined message, which was configured in the application dev responsibility. After configuring the form this way, I expect the Message to throw up when I navigate to the People Form. But it wouldnt happen. Could you please let me know the reason for the same? Are there any profile options which need to be enabled for this purpose? I am working in oracle HRMS as technical person, I want to Know about the Forms Personalization in Oracle HRMS, Sir Can you send me any documents in Forms Personalization in Oracle HRMS. I am very much thankful to you. i am currently customizing the HR Employee Self service module(leave of absence screen). view ->current and planned absence. What are the features in Oracle Apps HRMS module. Does any other module other than core HRMS required inorder to integrate.is OTL module required for this. Can i have any doc or ppt on this maodule regarding the features init. If any ppt describing the features which benifit or represent the module details. I tried out the example that you have written above. The only issue I faced was that I too was getting ORA-00911 error for the conditions. I changed the condition to :person.d_ptu_person_type = 'Employee' instead of the $item and it worked. Just an FYI. Secondly I have a WIP form which does not save but instead has a 'Continue' button to perform job completion. I want to validate the value of a job and prevent user from Continuing. Now since I dont have Save I cannot use WVR. I will have to rely on WNI on the subsequent items, but that would be unreliable if the user navigates through mouse. Can I use WVI or some other trigger? I have read your few materials, they are really very useful and easy too. *HOW CAN WE DO THIS TASK..
Getting errors while hiding text-item on form (PERWSHRG) through forms personalization. I am trying to hide text fields in from PERWSHRG through from personalization, but getting these errors. Frm-41034-A call to SET_ITEM_PROPERTY attempted to set the Navigable attribute of a non-displayed item. Frm-41017-Application design error. A SET_ITEM packaged procedure tried to turn on the Update Allowed property of a non-enterable item. Frm-41316-Cannot set DISPLAYED attribute of the current item". Can u guide me why these errors are coming, one more thing, one of the text items, I want to hide is the first item in the tab page. Hi Anil, u'r site is excellent.i need help. requirement is i need to call the custom form suppose TESTING_CUSTOM_CALL_FORM.fmb from sales order screen(OXOEORD.fmb) with parameter as order_number passed from order screen. I used form personalisation to set up the Special -> TESTING under TOOLS menu of Sales order, that will call my custom form when user clicks under the TOOLS->TESTING_CUSTOM_CALL_FORM but don't know how to pass parameter between the standard and custom form in forms personalisation. Can you please explain.